Fresh asparagus turns out tender but still crisp, coated with a flavorful oyster sauce in this quick and easy asparagus stir-fry. 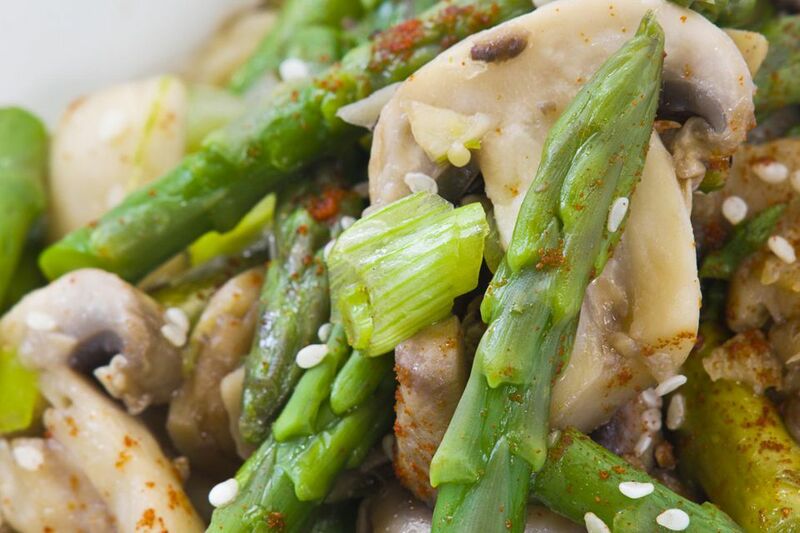 The asparagus is paired with mushrooms and red bell peppers - the recipe uses approximately 4 cups vegetables and is designed to have a bit of extra sauce to go with the rice. In a small bowl or measuring cup, stir together the chicken broth or stock, oyster sauce, sugar, and black pepper. In a separate small bowl, dissolve the cornstarch in the water. Heat wok and add oil, swirling so that it coats the bottom half of the pan. When the oil is hot, add the garlic and ginger. Stir for about 10 seconds until aromatic. Add the asparagus and stir-fry for 1 minute. Add the water, cover and let steam for 1 to 2 minutes, until the water is nearly absorbed. Push the asparagus to the sides of the wok. Add the mushrooms and bell pepper in the middle. Stir-fry for a minute, sprinkling a bit of rice wine or dry sherry over the mushrooms as you stir-fry. Push the mushrooms and bell pepper to the sides of the wok. Give the sauce a quick stir and pour into the middle of the wok. Stir the cornstarch and water mixture and pour it into the sauce, stirring quickly to thicken. Once the sauce thickens, stir to combine the vegetables in the thickened sauce. Stir in the sesame oil. Serve over cooked rice.